2 July 2008, at 1:01p.m. MEXICO - In June 2008, Hy-Line International teamed up with Hy-Line de Mexico and held a technical school in Zapopan, Jalisco, Mexico. 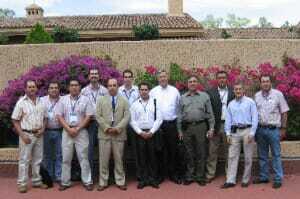 Representatives from Hy-Line International & Hy-Line de Mexico. The two-day seminar centered on managing the new Hy-Line W-36, in addition to general management and nutrition issues given high raw material costs. The technical school attracted more than 130 participants from 53 companies representing Mexico, Venezuela, Panama, and Argentina. Hy-Line International had three presenters at the event including: Thomas Dixon, regional business manager for Latin America; Dr. Douglas Grieve, director of global technical services, and Dr. Jesus Arango, statistical geneticist. Their presentations, along with others given at the school can be found on the library page of the Spanish portion of the Hy-Line website.